Even if you’re not a fan of Ernest Hemingway, or F. Scott Fitzgerald, any decent English major or lover of English literature will eat this movie up! I know that I did. I’m not a huge Hemingway fan myself, but after seeing this movie (even though in this movie he’s played by an actor) I think that if ever met Hemingway, I would like him as a person, or at least be able to tolerate him and, have always respected him as an artist. Actually, I’d probably be more like Owen Wilson’s character, so ecstatic and in awe that I’d barely be able to speak. 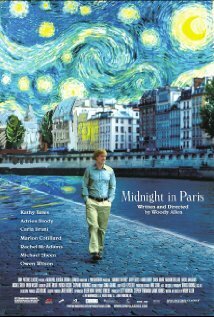 This film, written and directed by Woody Allen, was a great magical mystery tour for me, not only because as a writer I connected so well with the main character, Gil Pender (Owen Wilson), but that it was filled with so much meditation on writing, on life, on love, on the role of artist in society, and of course, on Paris. And though you have to be familiar with these works of art, with Hemingway and Fitzgerald, as well as Gertrude Stein, Pablo Picasso and Salvador Dali, in order to understand a lot of the subtle references, but it is naturally (as with any Woody Allen film I’m sure) very witty and charming. And it’s an excellent movie for writers and fans of literature, little tidbits dropped here and there, almost like advice from the legends of the past to those who hope to be the legends of the future. I would also suggest that if you do have leanings towards the Republican Party to be willing to take a few knocks while watching this film.